Your special day should be all about you, and it will be with our Birthday Party package! This all-inclusive service comes with an amazingly relaxing spa manicure, pedicure and delicious brunch. Speaking of relaxing, this also includes our teen facial! On top of that, you’ll receive our massaging shampoo treatment followed by a haircut of your choice. Don’t worry, though, we’ll blow dry and style your hair for you. Our makeup artists will give you a beautiful makeover with our top-of-the-line products! You won’t know when to stop taking selfies! It also wouldn’t be a birthday party without a cake! Avalon knows that our clients deserve the princess/queen treatment, and with us, your birthday is guaranteed to be special! 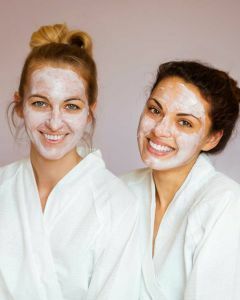 What better way to connect and spend time with your bridal party than by being pampered and dolled up! Don’t get stuck having separate hair and nail appointments at different locations! Our amazing team of beauticians can glam you up for your friend’s big day! In this package, you’ll receive a manicure, makeup creation and updo hairstyle!